Properties in El Pescadero average 4.8 out of 5 stars. Property 2: Pescadero Palace 1BR Ground Floor Casita w/swimming pool, Jacuzzi, on the beach! Property 3: Steps to Cerritos, Safest and Most Beautiful Swimming & Surfing Beach in Baja! Property 11: Chic Todos Santos Apt. w/ A Rooftop & Pool Access! A great little slice of paradise! Stay here! Loved this home away from home. A perfect set up for our family to chill, with 2 older teens. Spacious, thoughtfully outfitted main unit on ground floor with gigantic master suite. Peek a boo views from private patio and kitchen. Lots of places to lounge and spread out. Kids had a separate twin room with 3 pc bath (not ensuite but totally fine). So many wonderful shared spaces: believe the photos! There is one other separate guest unit on site but the home was never crowded. Location was great, around the corner from a couple boutique resorts but very private. Would recommend a car at this location for going into town (5 mins on lively local roads), but there's also lots to explore on foot. Just a mini 5-10 min hike to the beach (totally unspoiled, nearly private, got up very close with whales and turtles) or 20+ min walk down the beach to the swanky El Faro Beach Club (passes included, which such a bonus!). Superb hosts, Charles and Patricia (and cute dogs), live on site and but were never intrusive. Like staying with busy friends. Charles is a 5* resource, suggesting shopping and dining recommendations, secret beaches to explore, nearby walks to panoramic views, endless info to help planning day trips etc. His tips made our week. 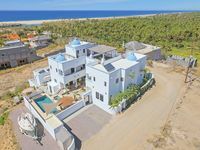 Todos Santos is mellow but full of little surprises and nearby villages to check out. Lots of locals and expats, and mainland Mexican tourists too. Town is quiet at night, so our days were busy and evenings relaxing.